GOOGLE ISN’T MAKING much headway diversifying its workforce beyond white and Asian men, even though the internet company hired women to fill one out of every five of its openings for computer programmers and other high-paying technology jobs last year. The imbalanced picture emerged in a demographic breakdown the tech giant released. The report underscored the challenges that Google and most other major technology companies face as they try to add more women, blacks and Hispanics to their payrolls after many years of primarily relying on the technical skills of white and Asian men. A slight rise in female workers compared to the previous year stemmed from a concerted effort to bring the numbers up. 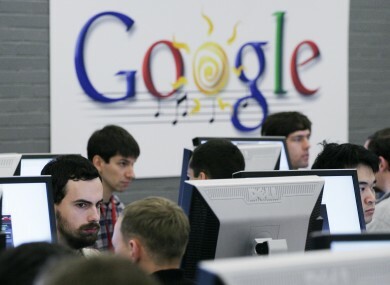 Google said 21% of the workers that it hired for technology jobs last year were women. The Mountain View, California, company added 9,700 jobs last year, although it declined to specify how many were for programming and other openings requiring technical knowledge. Overall, Google employed 53,600 people at the end of 2014. In the US just 2% of Google’s workers were black and 3% were Hispanic. Cutting across all industries in the US, 12% of the workforce is black and 14% is Hispanic. The latest snapshot of Google’s workforce comes roughly a year after the company publicly disclosed the gender and racial make-up of its payroll for the first time, casting a spotlight on a diversity problem vexing the entire technology industry. Other well-known technology trend-setters, including Apple and Facebook, subsequently released data revealing similar diversity problems. Mortified by the disclosures, Google and most of its other technology peers have been pouring more money into programs steering more women, blacks and Hispanics to focus on science and maths in schools and have stepped up their recruiting of minority students as they prepare to graduate from college. “Tech companies must move from the aspiration of ‘doing better’ to concrete actionable hiring to move the needle,” Jackson said in a statement. Email “Google's global workforce is overwhelmingly white and Asian men”. Feedback on “Google's global workforce is overwhelmingly white and Asian men”.